Continuing our series of interviews leading up to the April 1st (or April 2nd, if in the UK) premiere of HBO’s Game of Thrones! At the press junket the day after the episode 1 screening which I attended, I had the opportunity to interview a number of actors, as well as the executive producers, about this season of the show. You’ve already seen our interview with Charles Dance, and now we bring another veteran of the show: Michelle Fairley, Lady Catelyn Stark herself. To say that this is an opportunity I’ve long been looking forward to is an understatement—Fairley happens to play my favorite character in the novels, after all, and I was eager to learn more about her views on the character, and the series in general. Below you’ll get some hints about what’s in store for Catelyn this season, and maybe what’s in store for House Tully, too… and you’ll learn a bit about what it’s like to suddenly become so recognizable as the show’s burgeoning popularity grows by leaps and bounds. At the end of February, I had the privilege of joining international press in a two-day junket to London. 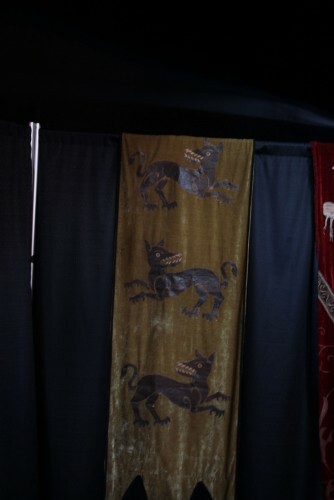 The first day featured a screening of the first episode of the new season—more on which later, when we’re allowed to say more about it!—and the second day featured several hours of round-table interviews with a number of actors, as well as executive producers David Benioff and Dan Weiss. Those will all be going up apace in the days to come. 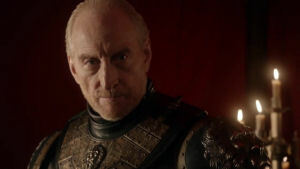 Of all the interviews, however, one of our personal favorites was the one with veteran, respected actor Charles Dance, who plays Lord Tywin Lannister, the uncompromising, ruthless patriarch of the Lannister clan, and we’ve decided that it was very well suited to leading off the interview. Having acted for some forty years, Dance had his start with the prestigious Royal Shakespeare Company, and went on to roles in many television and film productions, including parts in The Jewel in the Crown, Bleak House, The Last Action Hero, and Gosford Park. In the interview that follows, Dance discusses his role as Tywin Lannister in some detail, the scale and scope of HBO’s production, and his future legacy as an actor. Just a few days away from the release of the Blu-ray and DVD sets of the first season of Game of Thrones on both sides of the Pond (UK DVD, UK Blu-ray, US DVD, US Blu-ray), and it seemed like the right time to give a more in-depth look into the production of the set. If you’ve read our review, the production values of the added features completely blew us away. Thanks to HBO and Bryan Cogman, we learned a lot of this could be put down to the hard work of Herzog and Company, a creative production company who specializes in producing added content for DVDs and Blurays, among many other things they do. HBO put us in touch with Adam Vadnais, executive director of digital design at the company, and he was happy to answer seven (not a coincidence, that) questions for us! We had the opportunity to speak with Ed Bruce, Visual Effects Supervisor for Dublin-based post-production company Screen Scene, concerning the extensive work Screen Scene did on the VFX-side of the production. Of roughly 686 VFX shots for the first season of Game of Thrones, Screen Scene produced just over half of them, with 350 effects shots. Although BlueBolt were the lead VFX vendor on the project, and BlueBolt’s co-founder Lucy Ainsworth-Taylor was in the role of VFX producer for the show, it’s clear that Screen Scene (in collaboration with series VFX Supervisor Adam McInnes) made a major impact on the high quality of the visual effects for this season. In the follow interview, Ed discusses some of the effects for the show in-depth, the benefits of having so much post-production capability under one roof, and explains why some things may be harder to realize than fans may expect. Comic Con’s done, but we managed to land an exclusive interview ... with Nikolaj Coster-Waldau, who plays Ser Jaime Lannister in Game of Thrones. With the help of our correspondent (and site host!) 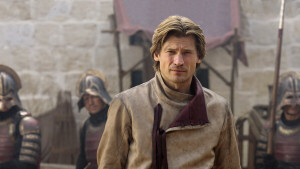 Rachel Blackman, we put together a few questions for Nikolaj during the convention. Scheduling problems made us miss the opportunity for a sit-down interview, but Nikolaj—who was taking off for Belfast on Saturday, rehearsing on Sunday, and already filming on Monday—was kind enough to answer our questions via e-mail. To read more of Nikolaj’s thoughts on the series, be sure to visit our first season interview with the actor. NOTE: There’s a spoiler, which we’ve hidden. Still, despite the fact that the battles never really transpired that some might have hoped for, there were some jaw-droppers, and those are thanks to BlueBolt, the lead VFX vendor for the series. We had the opportunity to speak with Lucy Ainsworth-Taylor, one of BlueBolt’s founders and the VFX producer for the first season of the show. We learn some surprising things along the way, with a refreshing level of frankness regarding the reality of producing VFX for a television program such as HBO. My understanding is that BlueBolt is a pretty new company, but its founders have quite a lot of experience in VFX for film and television. What role has landing the lead vendor role on Game of Thrones played in the present and future of your company? BlueBolt was in its infancy when we were approached by HBO, specifically Mark Huffam the producer. He knew our background history and persuaded HBO to come and meet us. It was a golden hand shake for a new company and allowed us to bring in some exceptional talent. The 3 founders of BlueBolt had been pivotal in building and creating one of the largest VFX houses in London, so had the experience to tackle this head on. Game of Thrones has certainly put us on the map as one of the best VFX boutique facilities in London. Sky Atlantic‘s excellent Thronecast post-episode web series somehow got the notion of inviting us as expert commentators. We were very grateful for the opportunity, as it’s been great fun (if sometimes a bit nerve-wracking!) When it turned out Natalia Tena (Osha) was going to be present for their final episode of the season, they very kindly offered to let us record an exclusive interview with her, which you can find below! Many thanks to Natalia for taking the time, and for Dan and Ruby at Thronecast! 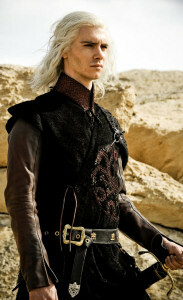 A gifted actor who’s lately been turning heads on both sides of the Atlantic, Harry Lloyd landed the role of Viserys Targaryen, the exiled prince yearning to restore his family to the rule of the Seven Kingdoms. As Daenerys’s brother, he has been an antagonist who’s dominated her entire life… until she marries Khal Drogo, and among the Dothraki finds independence and courage she didn’t know she had before. In the following interview, we discuss how Lloyd prepared for his role, the question he’d most like to ask author George R.R. Martin regarding the series, and more! 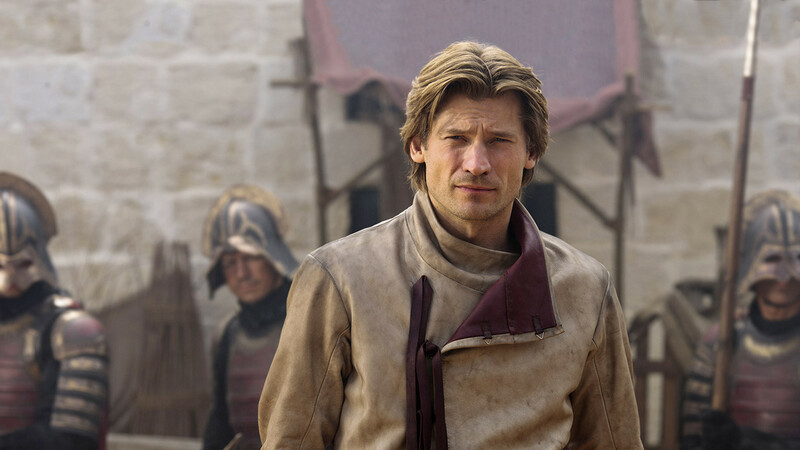 Of all the roles in Game of Thrones, Ser Jaime Lannister may be both the most popular and the most hated character in the novels at the very same time. And why not, when he’s such a larger-than-life figure, an arrogant, swaggering swordsman caught up in an illicit relationship with his own sister and largely despised by all honorable men for a single act? The Kingslayer, as he’s called, seems driven by ego on the one hand and by family on the other ... and in between those two forces, there’s a hint that there may be more than meets the eye. So it was a pleasant surprise when we first learned that Nikolaj Coster-Waldau—a Danish actor who’s made a splash in the U.S. with rolls in some of Ridley Scott’s big recent films and the leading role in the New Amsterdam television series—landed the role, bringing to the part all the energy and confidence that fans could have hoped for. Below, Nikolaj took time out of his schedule to answer a few of our questions about his role, the preparation for some of the scenes, how he sees Jaime’s relationship to his family, and more. Conan Stevens was one of the first actors that came to the attention of fans in association with the production, when it was simply still in development: he put out the word that he thought he’d make a fantastic Mountain that Rides. Many months later—after a pilot was ordered, after it was considered, after a second season was green lit—he landed the part he set out to get. Below is our exclusive interview with Stevens, who discusses his early career, his views on the differences between Thai and American productions, and more. Episode 3, “Lord Snow”, entered with the entrance of a character who is certainly a fan-favorite among fans: Syrio Forel, former First Sword of the Sealord of Braavos. 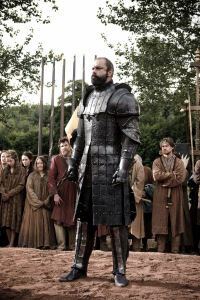 Forel is a water dancer, a master of the bravo’s style of fighting, who Lord Eddard Stark hires to train his daughter Arya (to keep her out of trouble, one expects, as much as to give her something to do). When Miltos Yerolemou was revealed to have won the role, there was a scramble for information about him. His show reels were examined, his credits considered. A gifted physical actor, Yerolemou has trained in a wide variety of acting disciplines, and seems to have found a particular knack for playing Shakespeare’s clowns, including having performed as a clown in a Royal Shakespeare Company production of Othello whose Desdemona happened to be played by none other than Natalia Tena, who plays Osha in Game of Thrones. With his extensive acting background, Miltos has brought boundless energy to his portrayal of Syrio Forel. In the audio interview below, we discuss his entry into acting, the variety of training he’s had, his working with the legendary choreographer William Hobbs to develop the “water dance” style, his thoughts on young actress Maisie Williams, and more. Via our friends at MTV Geek, we’re pleased to be able to provide the first in a series of articles that take a close look at George R.R. Martin’s Song of Ice and Fire series from the perspective of a Ph.D. in Medieval history and literature. Each book in the series will be analyzed against actual historical events in the Dark and Middle Ages along with literature, factual or fictional, from that time. This is the first time the author is reading the novels, so keep in mind that she’s unaware of major spoilers but that spoilers will be revealed as she progresses through the material. 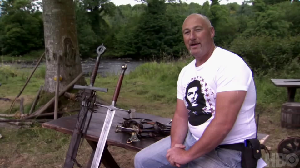 Tommy Dunne is the weapon master for Game of Thrones, meaning that he’s overseen the conception, design, and production of the many, many weapons used in the production. The total number of weapons has gone into the hundreds, we’ve been told, and all that thanks to Mr. Dunne and his team. His career in television and film production was not something he really planned for, but began (tellingly enough) with a little film named Braveheart. From there, Dunne has gone on to work in some pretty remarkable productions. Just a short list: Saving Private Ryan, Gladiator, V for Vendetta, and both Band of Brothers and The Pacific. He’s certainly no stranger to high-end productions, nor is he a stranger to working HBO. Read below to discover how he got his start, the influences behind some of the weapon designs, and the surprise he got when it came to creating the swords of the white walkers. There are a couple of complaints I have seen made on Twitter and on various forums regarding the first episode that, quite frankly, baffle me. This may be something of a minefield considering the topics, but I tried sitting on my hands and it didn’t work. One of problems readers (and viewers) new to fantasy often bring up is the wealth of strange names, odd places and curious words that don’t always mean what you think they should mean. Of course, with Game of Thrones one could easily look up any of those odd words on the various sites dedicated to the books, but in doing so one would run the risk of being spoiled. In light of this, we’ve put together a mini-lexicon for Game of Thrones-newbies that basically gives short, spoiler-free explanations for some of those words that might give you pause. We’re not covering characters here (see our guide to the Characters for that) but if there’s something else you think we have missed, let us know!